CWEIC led a delegation of over 70 Commonwealth businesses to the 9th Vibrant Gujarat Summit in Gujarat, India. 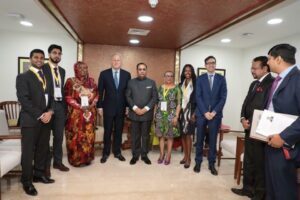 During the summit CWEIC Chair Lord Marland and two of CWEIC’s Strategic Partners from Nigeria and Uganda met personally with the Honorable Chief Minister of Gujarat Vijay Rupani. Lord Marland thanked the Honorable Chief Minister for receiving the Commonwealth delegation, and discussed the Memorandum of Understanding signed between CWEIC and the State of Gujarat at the MSME conference earlier in the weekend. The MoU sets out the framework for a collaborative programme between CWEIC and the State of Gujarat to help Gujarati SMEs export to the Commonwealth. CWEIC Advisory Board members Dr Amina Hersi Moghe (Uganda) and Folorunso Alakija (Nigera) discussed with the Honorable Chief Minister their ambitions for their respective companies to strengthen trade ties with India.